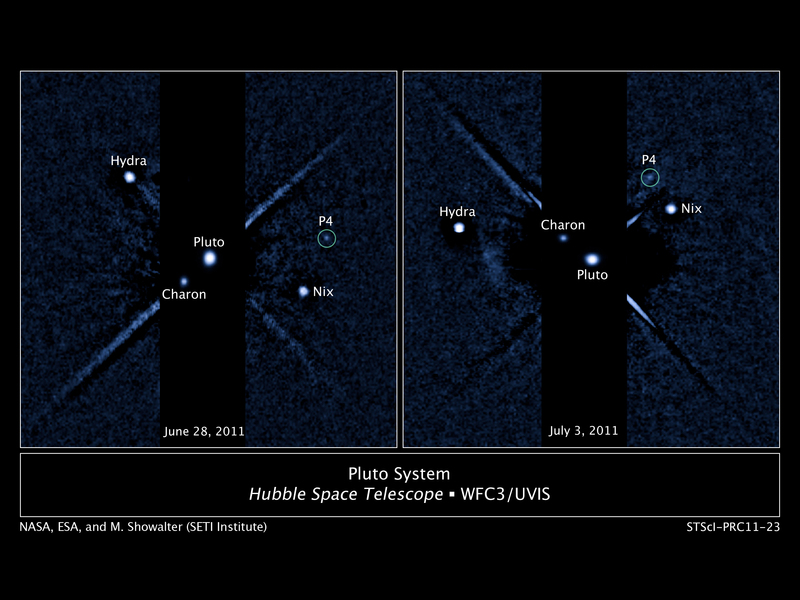 This is pretty nifty: astronomers have discovered a fourth moon orbiting Pluto! It doesn’t have a name yet — it’s designated S/2011 P1 (or just P4 informally) — and it’s only about 13 – 34 km (8 to 21 miles) across. The size is estimated by measuring its brightness and assuming it’s icy like Pluto itself — a more reflective (white or icy) object would appear brighter than a darker object if they are the same size. Since its actual reflectivity isn’t known, the size has a wide range. But it’s still pretty dinky. For comparison, Pluto itself is 2300 km across, and its biggest moon Charon is well over 1000 km in size. I’ll note our own Moon is 3470 km across, so even Pluto is pretty small. See how it’s moved? Mind you, in the week or so between these two images Pluto moved substantially compared to background stars, and the moon moved along with it around the Sun at the same time it’s going around Pluto. You can see the motion of the other moons as well. 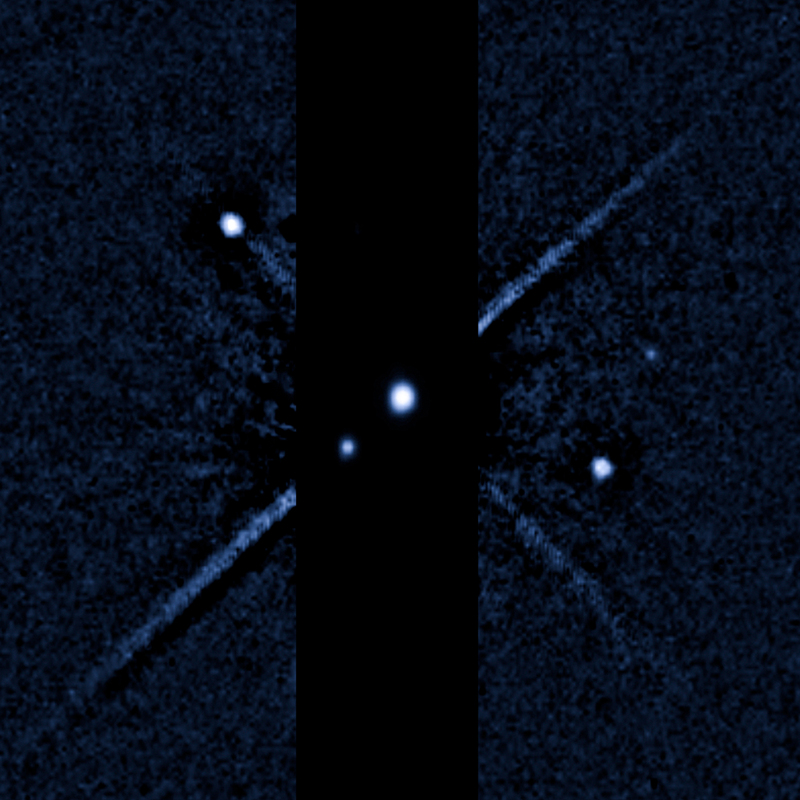 In the image, the diagonal lines are an optical effect inside the telescope itself. Pluto is very bright, so the astronomers used some processing techniques to make it appear much fainter, taking multiple images and subtracting one from the other to remove the glare of Pluto (it doesn’t work perfectly, which is why there is a black strip across the image; that blocks unwanted noisy light). I did this myself on many images when I worked on Hubble. It’s amazing how well it works, as you can see in the image above. Mind you, Pluto was 5 billion km (3 billion miles) from Earth when this image was taken! But we’ll soon get much better pictures: the New Horizons probe will fly past the tiny world in 2015, snapping away as it does. We’ll probably learn more about Pluto in a few hours than we have since its discovery in 1930. I wonder what they’ll name this iceball? The two moons Nix and Hydra (discovered in 2005) were named after Roman mythological characters associated with night time and Pluto. Cerberus seems like an obvious choice, but there’s already an asteroid with that name. Maybe they can change the spelling a bit to Kerberus to get around that. There’s already an asteroid named Persephone, too, if you’re curious. We’re running out of good names! Well, whatever it’ll be called, it’s there, and we’ll see it up close in personal in just a few more years.